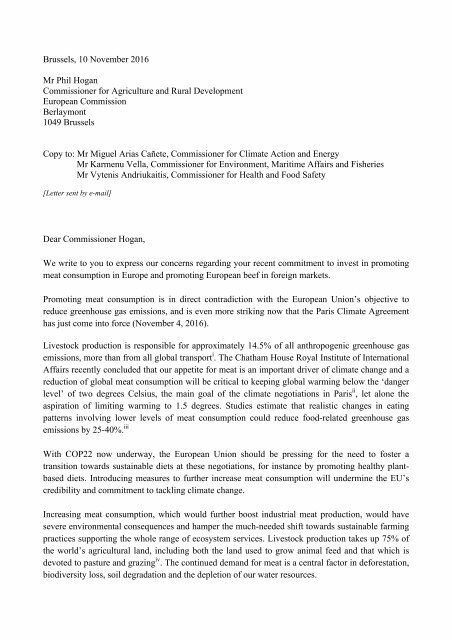 Brussels, 10 November 2016 Mr Phil Hogan Commissioner for Agriculture and Rural Development European Commission Berlaymont 1049 Brussels Copy to: Mr Miguel Arias Cañete, Commissioner for Climate Action and Energy Mr Karmenu Vella, Commissioner for Environment, Maritime Affairs and Fisheries Mr Vytenis Andriukaitis, Commissioner for Health and Food Safety [Letter sent by e-mail] Dear Commissioner Hogan, We write to you to express our concerns regarding your recent commitment to invest in promoting meat consumption in Europe and promoting European beef in foreign markets.  Promoting meat consumption is in direct contradiction with the European Union’s objective to reduce greenhouse gas emissions, and is even more striking now that the Paris Climate Agreement has just come into force (November 4, 2016). Livestock production is responsible for approximately 14.5% of all anthropogenic greenhouse gas emissions, more than from all global transport i . The Chatham House Royal Institute of International Affairs recently concluded that our appetite for meat is an important driver of climate change and a reduction of global meat consumption will be critical to keeping global warming below the ‘danger level’ of two degrees Celsius, the main goal of the climate negotiations in Paris ii , let alone the aspiration of limiting warming to 1.5 degrees. Studies estimate that realistic changes in eating patterns involving lower levels of meat consumption could reduce food-related greenhouse gas emissions by 25-40%. iii With COP22 now underway, the European Union should be pressing for the need to foster a transition towards sustainable diets at these negotiations, for instance by promoting healthy plantbased diets. Introducing measures to further increase meat consumption will undermine the EU’s credibility and commitment to tackling climate change. Increasing meat consumption, which would further boost industrial meat production, would have severe environmental consequences and hamper the much-needed shift towards sustainable farming practices supporting the whole range of ecosystem services. Livestock production takes up 75% of the world’s agricultural land, including both the land used to grow animal feed and that which is devoted to pasture and grazing iv . The continued demand for meat is a central factor in deforestation, biodiversity loss, soil degradation and the depletion of our water resources.